Eli Chilton is a Playwright. His newest play “The Sandcastle“, is receiving a staged reading at PlaySmelter Festival. He lives and works in the community of Moose Factory, with his wife and three children. He is currently working at the John R. Delaney Youth Centre, as a radio DJ/producer and youth worker. 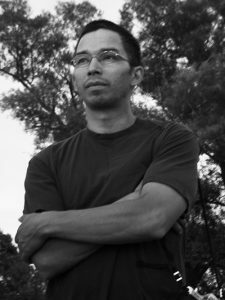 Along with being a dramatist with the completion of The SandCastle, he is a poet, who has poems published in the Poetry Institute of Canada’s national book competition. He is also an avid photographer, outdoorsman, and a qualified cook. 1. What are you looking forward to most with respect to the staged readings? How do you think it might contribute to the ongoing development of The Sandcastle? I am most looking forward to hearing the words of the play spoken aloud. It is comparable to writing music for musicians to play, and only hearing the music in my head, and finally I will hear the band play it aloud. This opportunity will allow me to enjoy the music, so to speak, but also change any notations or melodies, based on the fact that it now being played for everybody to hear. 2. An elderly couple as the main characters in a play is somewhat uncommon, but it you use it to set up an intriguing ambiguity: is Elsa’s condition a form of wisdom? Or sickness? Aging makes us access our bodies differently, interpret the world differently through our changed bodies. At least, this is where my thoughts go when reading about your play, but is age significant to you in the way you’ve written The Sandcastle? Age, in The Sandcastle, is a hugely significant factor. In many ways the play is about how age changes our perception of reality as human beings, in relation to one another, and to our environment as a whole, and with that change comes wisdom or folly, depending on who it and the particular time they are at in their life. The age of the elderly couple of George and Elsa is an indication of a life lived full and long within the confines of community and family. It tells us that the gift or curse that Elsa possibly is stricken with, has been normalized with age, inside her life and her marriage with George. 3. Can you tell us a little bit about what it’s like to work as an artist in Moose Factory? Working as an artist in Moose Factory is both challenging and freeing for the simple reason that Moose Factory is a small and remote community. There are none of the distractions that a major city has, and because of this, there is much more focus and concentration on the work at hand. The challenge is that, along with having such freedom and focus, you are isolated from the larger arts community, so there are no working relationships nearby to share ideas and thoughts with about one’s art. It is a beautiful thing, though, to practice your art in your hometown, where the heart and soul of your culture and family resides.